looked around at other country's suggestions and from what I saw they ALL suggested it. 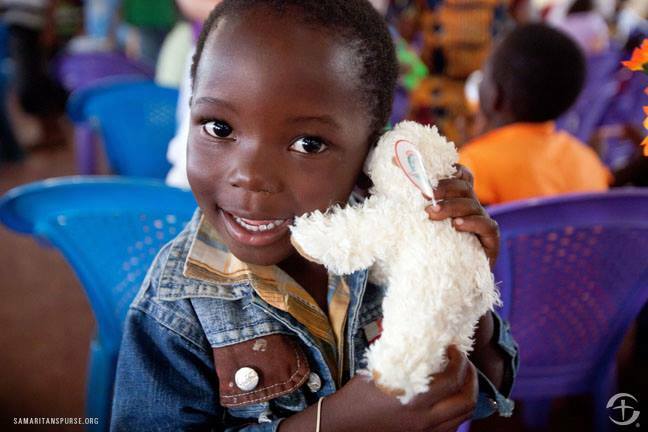 Samaritan's Purse also has been (as part of their Christmas catalog) giving stuffed lambs to children around the world for 20 years to comfort them. So, the ministry thinks it is a good idea, so that is one reason. Then there's the fact that, for me personally, stuffed animals have always been special. Not only were they fun to play with-we had "zoos" were "vets", etc., they always seemed more "real" than the rest of my toys. When I was probably in the 2-4 age range a stuffed duck came to me across the miles in a box from a far away relative. 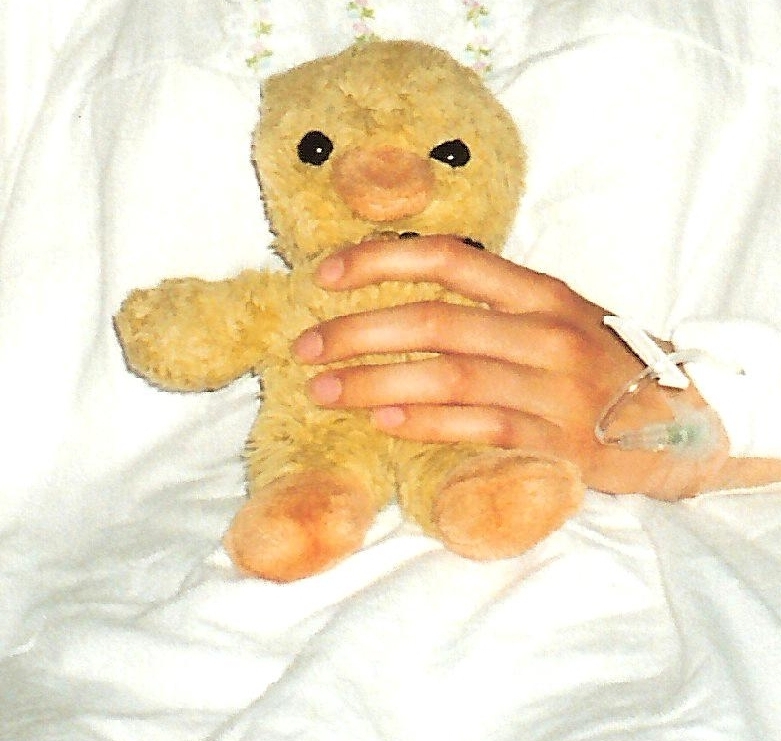 That duck was very special to me as a child-slept with, played with, loved nearly to death. Even when I was in the 10-14 range "Ducky" was special as I had brain surgery and he was brought to me in the hospital and stayed with me. We've all seen kids carrying around their favorite animal...a "friend" to whisper secrets to, to hold tight at night when scared, a soft reminder of someone that cares. We hope to give these children, who are likely in hard circumstances a similar "friend" and reminder of being loved. But that's just me, my family, but it also seems to be true of others around the world. 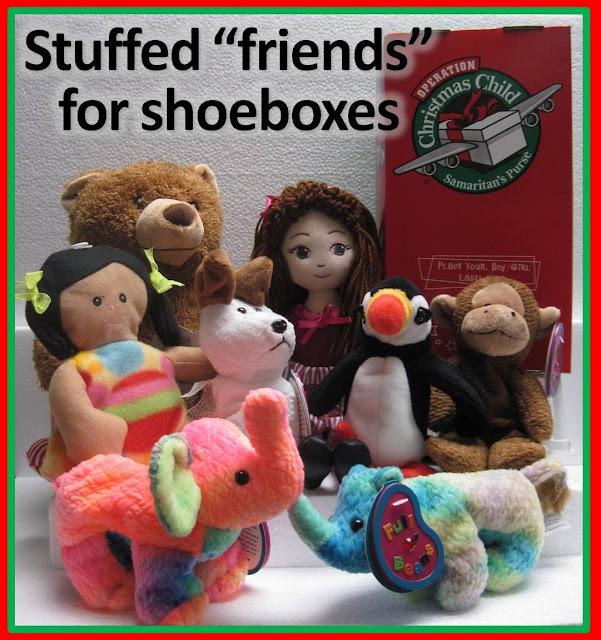 The author of the Shoebox Shoppers Facebook page got to go on a distribution to Tanzania, in a list of things that the kids most liked she said "Stuffed toys--please include a stuffed toy in every box. I guess there may be some parts of the world where a certain animal might not be good BUT every kid who got an animal in Tanzania LOVED it. The ministry asks us to put a stuffed toy in and I do in every box!" When I shared the list on my personal Facebook page a friend who's a missionary in Zambia and has been on a distribution, and will be a partnering organization with OCC for this upcoming year commented and said "This is good! I will second this for here in Zambia!" Read an interview I did with her after the distribution: Operation Christmas Child Shoebox Distribution in Zambia. A friend, Sue, of the Shoebox Shoppers author, went on distributions in Uganda and reported "I really do trust that God will lead me to pack the right things and that certain shoe boxes will get to the right children. That said, here’s a list of my thoughts on what I learned that will guide me as I pack this year and maybe help you pack mindfully. In every box no matter the age or gender: a ball, a stuffed toy, paper, an art supply (crayons, markers, colored pencils, watercolors), pencils/ pens, toothbrush, a shirt if possible, a letter/note with photo of yourself or your group...I came away looking to pack more bigger stuffed animals this year even if it meant the box had less items. The bigger stuffed toys really wowed the younger ones. I am looking for more durable items that will hold up better to play. I still shop the dollar store some, but more carefully. " 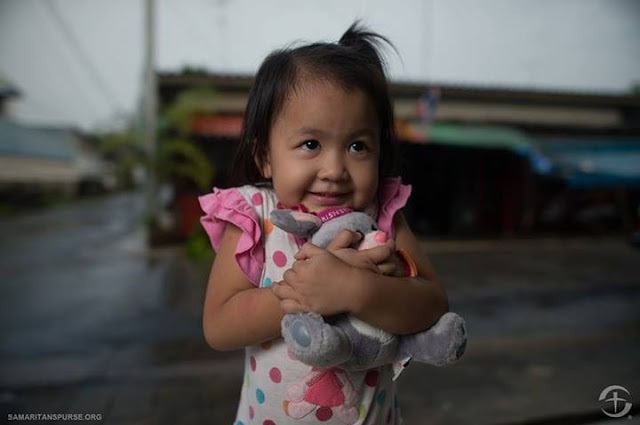 Samaritan's Purse shares this sweet story of a young lady, Yuliya, who received an Operation Christmas Child shoebox as a child in a Central Asian country "When I lifted the lid on my purple plastic shoebox, the first thing I saw was a stuffed dog. I was filled with exuberant joy! I just remember hugging it. Even though I had toys growing up, the dog was an item you couldn’t find in my country. It was really soft and had puppy eyes. It was my new best friend, my newfound treasure....I still have my stuffed dog 14 years later. " 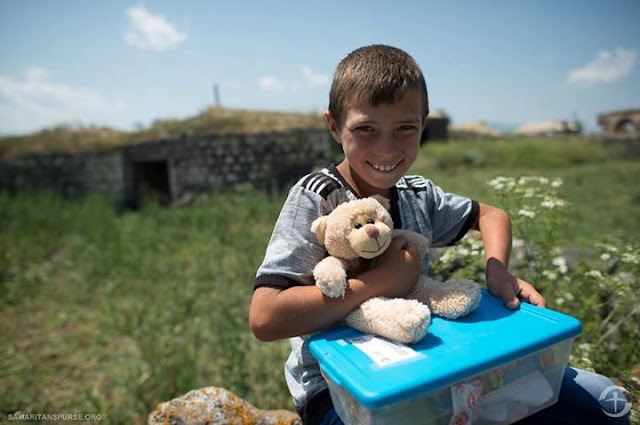 (Cited: Shoebox Stories Yuliya and a Puppy)"
And over the years as Samaritan's Purse has taken OCC shoeboxes to kids around the world, they've found stuffed animals to be a favorite of children around the world. 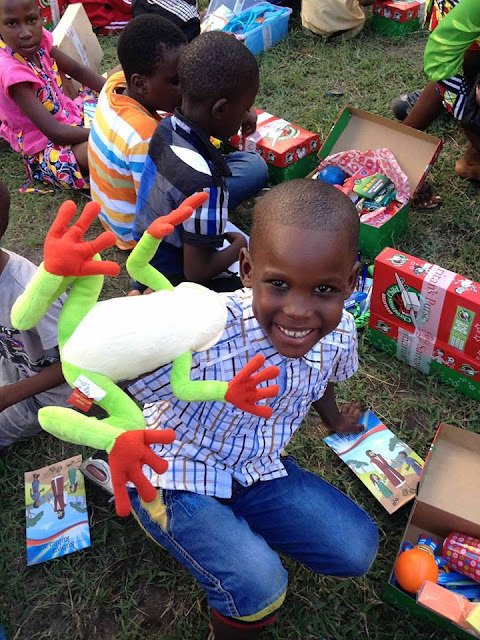 Here are some photos of kids around the world loving their shoebox animals. Look how excited these children are! Stuffed animals are great to include in shoebox gifts. Remember to start your shoebox with a “WOW” item a child will love, such as a doll, soccer ball with pump, or a stuffed animal. Then fill with other toys, hygiene items, and school supplies. You can find more gift suggestion ideas here: http://bit.ly/OCCWOWItems. Don’t forget—National Collection Week is November 16-23! If you would like to see more images of children receiving shoeboxes and read about the experiences of others handing them out check out our Operation Christmas Child Shoebox Distribution Stories series. 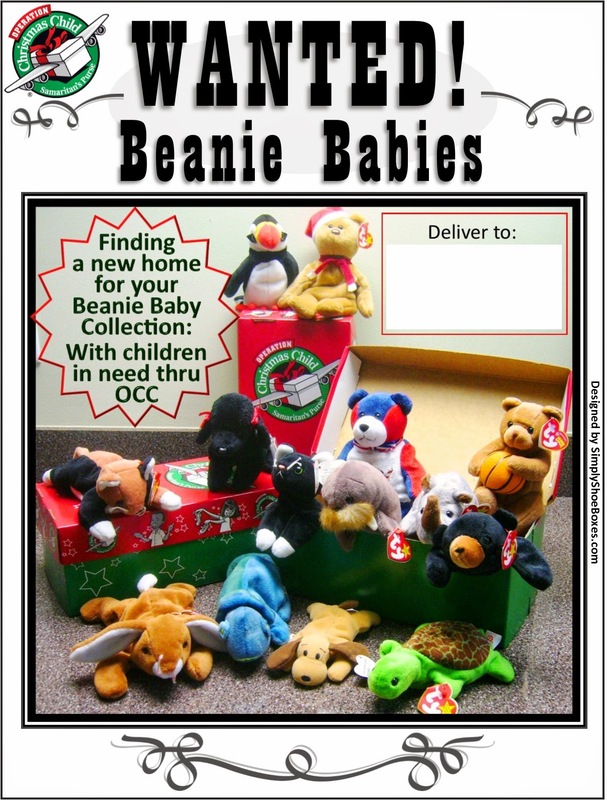 Many of us have collections of Beany Babies in our attics! Would they be suitable for the shoeboxes? Yes-they are my favorite!!! As long as they are like new they're GREAT-small & sturdy! We've actually bought old collections to send off Ebay. My Wal-Mart has a clearance section for toys. I go there for stuffed animals. They range in price from $1- $5 usually. I just picked up 9 stuffed animals for $10 for our church packing party.